If true, this body will use simulation. If false, will be 'fixed' (ie kinematic) and move where it is told. If object should have the force of gravity applied. When a Locked Axis Mode is selected, will lock translation on the specified axis. Lock translation along the X-axis. Lock translation along the Y-axis. Lock translation along the Z-axis. When a Locked Axis Mode is selected, will lock rotation to the specified axis. Lock rotation about the X-axis. Lock rotation about the Y-axis. Lock rotation about the Z-axis. Locks physical movement along specified axis. If object should start awake, or if it should initially be sleeping. User specified offset for the center of mass of this object, from the calculated location. The maximum angular velocity for this instance. If true, this body will be put into the asynchronous physics scene. If false, it will be put into the synchronous physics scene. If the body is static, it will be placed into both scenes regardless of the value of bUseAsyncScene. Whether this body instance has its own custom MaxDepenetrationVelocity. The maximum velocity used to depenetrate this object. Whether this instance of the object has its own custom walkable slope override setting. Custom walkable slope setting for this body. See the 可行走斜面 documentation for usage information. Behavior of this surface (whether we affect the walkable slope). 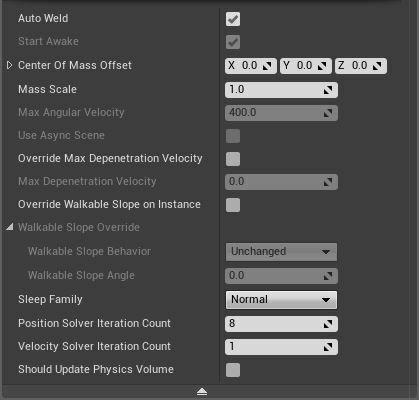 Override walkable slope, applying the rules of the Walkable Slope Behavior. The set of values used in considering when put this body to sleep. This physics body's solver iteration count for position. Increasing this will be more CPU intensive, but better stabilized. This physics body's solver iteration count for velocity. Increasing this will be more CPU intensive, but better stabilized. Whether or not the cached PhysicsVolume this component overlaps should be updated when the component is moved. Should 'Hit' events fire when this object collides during physics simulation. Allows you to override the PhysicalMaterial to use for simple collision on this body. If true Continuous Collision Detection (CCD) will be used for this component. If true, this component will generate individual overlaps for each overlapping physics body if it is a multi-body component. When false, this component will generate only one overlap, regardless of how many physics bodies it has and how many of them are overlapping another component/body. This flag has no influence on single body components. If true, this component will look for collisions on both physic scenes during movement. 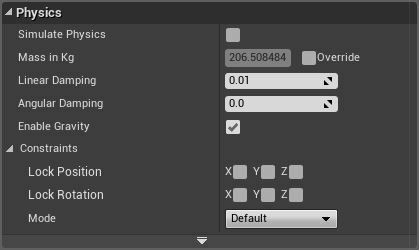 Only required if the asynchronous physics scene is enabled and has geometry in it, and you wish to test for collisions with objects in that scene. If true, component sweeps with this component should trace against complex collision during movement (for example, each triangle of a mesh). If false, collision will be resolved against simple collision bounds instead. If true, component sweeps will return the material in their hit result.